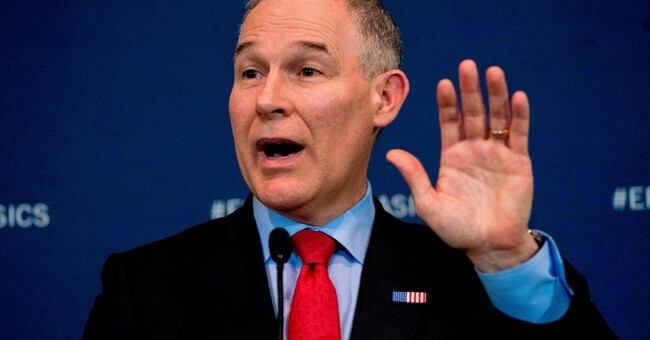 EPA Administrator Scott Pruitt is on Capitol Hill Thursday to defend himself amid several allegations that suggest he has a broken ethical compass. Reports of exorbitant travel and security fees and cushy condo deals led several lawmakers, including a handful of Republicans, to demand his resignation. The House Environment Subcommittee had both policy and administrative questions for him, with an emphasis on the latter. Rep. Frank Pallone (D-NJ), in his opening remarks, noted how Pruitt rented a condo well below market value and made untrue statements about it, while also sounding off on the chief's "extravagant spending." "You are unfit to hold public office and undeserving of the public trust," Pallone said, though he noted that did not mean he disliked him. "I think your actions are an embarrassment to President Trump," Pallone later added. "If I was the president I wouldn't want your help. I'd get rid of you." Pruitt defended his position as EPA head, telling the panel that real regulatory reform is happening. The changes they've made, such as repealing the Clean Power Plan, has saved Americans $8 billion. The agency is successfully "pruning back decades of regulatory overreach." "I promise you that I, more than anyone, want to provide hard facts," the EPA chief said about the troubling media reports. "I have nothing to hide as to how I've run the agency." Many of the reports are "half truths" and "twisted stories" and are coming from sources who "want to derail the president's agenda," he added. After asking a few policy questions, Chairman John Shimkus (R-IL) asked Pruitt to use his remaining minute to better clear up some of the allegations. Pruitt only reiterated that he was happy to correct half truths. At this point there had still been no detailed questions related to the ethics scandals. Rep. Paul Tonko (D-NY) took the baton from the chairman and asked very specific questions about a few of the scandals hanging over Pruitt's head. He was particularly interested in the suspicious pay raises to two of his friends that were signed off by his chief of staff. He gave him the opportunity "to set the record straight." Pruitt did not deny that he authorized the raises, only that he "was not aware of the amount of the raises nor of the bypassing or PPO process not being respected." Other Democrats on the panel wanted to know about a "troubling pattern" of retaliation against employees who disagree with his leadership. Pruitt said that he did not remember having conversations about dismissing employees for speaking out against him.